Woody Allen has been making films for close to 50 years, so it goes without saying that his productions run the gamut from masterpieces (The Purple Rose of Cairo, Crimes and Misdemeanors) to instantly forgettable (September, Anything Else). 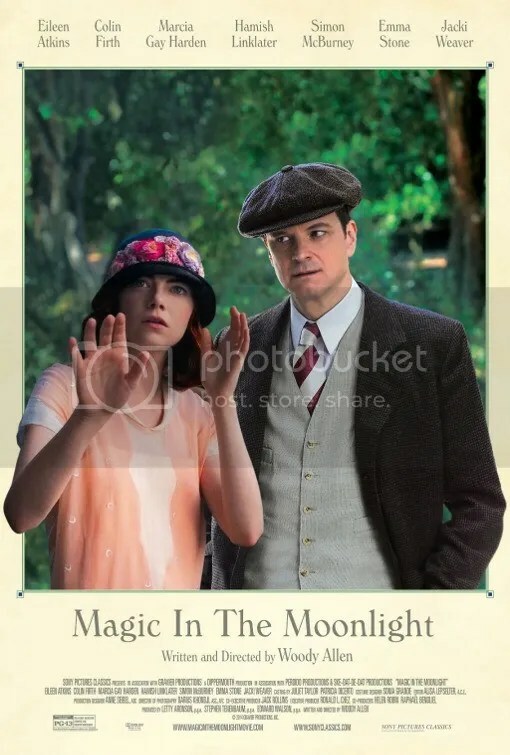 I’m sorry to report that Magic in the Moonlight sits firmly in the latter category. Even the best of us can have an off day, but I still find it fascinating that a filmmaker can immediately follow up a work of art like Blue Jasmine with an offering that is flawed at such a rudimentary level. As is often the case with his fumbles, Woody starts out with an interesting idea. At the behest of his fellow illusionist colleague, Stanley Crawford (Colin Firth) is invited to the mansion of the Catledge family on the French Riviera to debunk an ethereal young woman named Sophie Baker (Emma Stone) who claims to be a psychic. The family is apparently beguiled by this attractive twenty-something. British Stanley is a celebrated magician who performs in disguise as a Chinese conjuror named Wei Ling Soo. With the exception of the friend who invites him, Howard Burkan (Simon McBurney), no one at the estate is aware of Stanley’s other persona. This then will allow him to observe the clairvoyant and ostensibly expose her as a fraud. For half the movie, the director has our attention. Colin Firth is enjoyable as this cranky cynic looking to demystify an inscrutable but charming visionary. They banter back and forth. The mood is light, the scenery is pretty and the 1920s milieu is enchanting. As they spend time together, Sophie is able to discern personal details about Stanley’s life and even those of his aunt Vanessa (Eileen Atkins). Incidentally her minor role was my favorite part. At this juncture, Stanley begins to seriously question his deep-rooted rationalism. Then he decides he has feelings for this girl. Sorry. Nope. Not buying it. These realizations are a complete betrayal of Colin Firth’s character. That this lifelong curmudgeon would all of sudden, fall head over heals in love with a woman he had regarded as a charlatan is a bunch of hooey. Add to this the unsavory fact that he is old enough to be her grandfather and it adds another layer of ick. Who’s Helena Bonham Carter’s love interest going to be in her next film….Justin Bieber? Because their age difference is exactly the same. Everything up until this point is decent. However the story falls apart from there. Then a plot twist is added and the reveal is like deflating a hot air balloon as it rapidly descends back to earth. From then on there is absolutely nowhere for the narrative to go. His comment on faith is by now a Woody Allen cliché. Magic in the Moonlight isn’t the worst Woody Allen film, but it’s 238,855 miles away from being the best. This entry was posted on August 12, 2014 at 11:07 pm and is filed under Comedy, Romance. You can follow any responses to this entry through the RSS 2.0 feed. You can leave a response, or trackback from your own site. I think it might be best if Woody Allen made a film once every few years instead of being so prolific. His recent movies in particular have been pretty hit-or-miss. Not too big on either Firth or Stone so I’ll pass on this. Good advice. I remember back in 2000 he did Small Time Crooks, which I really enjoyed. Then he did a string of forgettable ones: The Curse of the Jade Scorpion, Hollywood Ending, Anything Else, Melinda and Melinda before finally doing another masterpiece, Match Point in 2005. Saw this movie was half an hour late, thinking we would watch the first half again. There was no need to. I did enjoy the bantering between Sophie and Stanley. Well the first half was the best part but I’d just wait til DVD. If you’re looking for light romance I’d recommend The Hundred-Foot Journey. It’s much better than this. Hi Mark! Amazing review as always. I’m not kidding when I tell you that someone said “aghhh!” at loud when Firth and Stone kissed in my screening, honestly, never in my life I thought that Mr Darcy himself could get such a reaction. But the actors are not to blame at all, they are their usual incredible, but the age difference is something hard to look away from, at least in Manhattan Allen acknowledges it as an “issue”, probably that’s why it bothered me so much this time around. The cinematography is stunning, such as the performances, this premise could have worked very well with a much more cohesive cast in my opinion. I agree the cinematography of that gorgeous scenery made me want to visit the French Riviera. I think a May-December relationship is always going to be addressed but it doesn’t have to matter if the romance is there. Here it made absolutely made no sense for these two to fall in love. Their personalities couldn’t have been more diametrically opposed. So glad you commented. I miss our podcasts on the MGCTv show!! I know!!! Me too 🙂 We should tell them about doing an episode for Guardians of The Galaxy. Not to sound rude, but have you seen any Woody Allen movies? I’d estimate that 1 in every 4 movies he’s ever made has involved someone older being romantically involved with someone younger. Example: Manhattan. Woody Allen and Mariel Hemingway are 26 years apart (it’s not quite 28 like Stone and Firth…) and it’s still one of his best movies. I don’t see how this makes the movie more “unsavory” when it’s occurred both in Allen’s movies and his life–generally speaking, it’s unsavory, but we’re used to it with Woody Allen. Anyway, this point aside, good review, Mark. I’m going to see this on Saturday and I’m sure you can tell that I can’t wait. I’m not expecting much, since it’s gotten its fair share of negative reviews, but from what I’m hearing (and what you’ve affirmed), it’s lackluster, but not terrible. Lackluster, I can tolerate. Most definitely. What did you think of September? I thought the movie was all right. The best part about it might’ve been that for the first time in two years, I was in a packed theater where everybody was at least half a century older than myself. The theater was packed?! Mine was empty. The movie is doing horrible business. Hasn’t even broken $5 million after 4 weeks. It was halfway full, which is packed by the standards of a movie theater in my area. If it’s scenery you’re after, go see The Hundred-Foot Journey. It takes place in the gorgeous South of France AND it’s a better film overall. The box office successes of both Midnight in Paris and Blue Jasmine have really raised expectations in the last few years. Can’t say I’m shocked to hear this was a bad film. Just based on the premise, it didn’t seem like it would be a good. I don’t think I would buy a sudden change in a character like that either and I’m sure I would be equally annoyed by it. Also grossed out by the age difference between Firth and Stone. Ick is right. I do tend to give Woody Allen the benefit of the doubt, but he disappointed me with this one.